Lizzy Siddal worked as a dressmaker in a shop near Piccadilly, London, when she was 'discovered' by the painter Walter Deverell, whose model she became. She also worked for William Holman Hunt ("Sylvia") and John Everett Millais ("Ophelia"). She detested Hunt after he and Frederic Stephens had convinced the painter John Tupper for fun that she was Hunt's wife. From 1852 onwards she was more than just a pupil to Dante Gabriel Rossetti: she became his muse and his lover as well. Supported by John Ruskin, who admired her work and acted as her patron, she travelled to Nice and Paris in 1855 to improve her health. In 1857 she exhibited for the first time at the preraphaelite Salon at Russel Place, London. After a long and often difficult engagement she married Rossetti in 1860. They lived in London where she worked on her watercolours and assisted in decorating William Morris' Red House. Lizzie suffered from depressions and on top of this she gave birth to a still-born daughter on May 2, 1861. On Februari 10, 1862 she dined with Rossetti and Algernon Swinburne at the Sabloniere Hotel at Leicester Square. 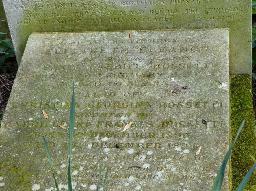 Afterwards Lizzie went home and Rossetti went to the Working Men's Institute where he taught art. When he came home at eleven he found her unconscious from an overdose of laudanum. It was already too late to save her life and she died early in the morning. The note she left was destroyed by Madox Brown and its contents will never be known. 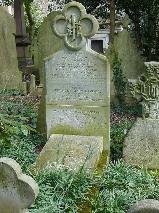 Rossetti buried his poems with her at Highgate Cemetery. In 1869 Rossetti wanted his poetry back and he obtained permission for the coffin to be opened. This happened in his absence and together with the volume a handful of red hair emerged from the coffin. The poems were returned to Rossetti (and published in 1870 as "Poems") and he was told that she hadn't changed much since her death. 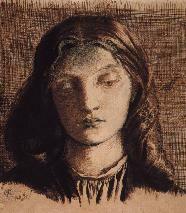 Rossetti re-collected her work himself, but until recently it was always overshadowed by her tragic personal life.